The law of acquiring land in the country of 166.4 million people should be repealed. The cultivable land in this agriculture based country is decreasing exponentially. If we can’t stop it people will be hungry and turn carnivorous. When it comes to land grabbing the army reigns supreme. In a tiny country of a staggering population of 160 million it is causing public nuisance by hindering public development projects to alleviate the sufferings of the common masses. The cantonment is the biggest problem causing traffic jams in Dhaka.The cantonment is blocking two major highways through Dhaka. If these two roads are opened to public and private vehicles there would be ease of traffic through Dhaka. The traffic going to Uttara and Gazipur do not have to go via Kakoli and Banani. Instead it can go through the main cantonment road. Similarly, traffic from and to Mirpur smoothly going via Kochukhet and railgate can further ease the traffic jam in Dhaka. This huge piece of invaluable land in the middle of Dhaka must not be sacrificed for a fancy air strip for military aviation and the air force in a city of clogged roads tormenting the public. Besides, it never belonged to the army. It was civil aviation property that was encroached upon by the army during despotic rules of Zia and Ershad. The old Tejgaon airport civil aviation property should be immediately put into public use by allowing the JICA funded metrorail transit system run in a straight line through this public property and the rest of the premises should be developed by a trio of Bangladesh`s famous architects as a recreational park and play grounds for our children. Nowhere else in the world you will see a cantonment occupying a huge chunk of land in the middle of a capital creating immense miseries for its inhabitants. I am also shocked to see the media’s silence and impotence at pointing out how the army has made life miserable for Dhaka dwellers by encroaching upon public property and obstructing smooth flow of traffic. On a different note, Jamilur Reza Choudhury is a jack of all trades but master of none. Because of selfish people like him the newer generation is not allowed to flourish. What does a civil engineer know about IT. Our stupid bureaucrats and ministers are seen courting him to hide their ignorance and incompetence. There are many other young experts in Bangladesh who should have been promoted long time back instead of sycophants like JRC. But at the same time I fully agree with JRC`s opinion that the BAF airbase should be removed from Dhaka and shifted elsewhere in a old airfield outside Dhaka. The army already enjoys oo many benefits that the common man can hardly dream of. There is no point in blaming anyone for the situation in Dhaka right now, because that is not going to improve the living conditions of the residents of the city. Driving people out of the city may not also be a good option, as it will need people to continue the economic growth. Driving out people may actually slow the growth of the economy. 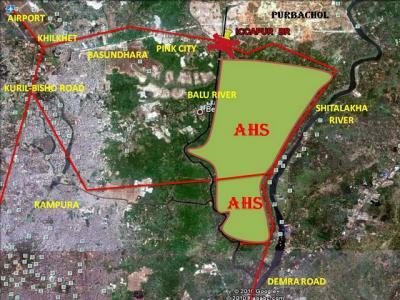 To improve the current situation in Dhaka, especially, the living standards of the residents, it is first necessary to evaluate the existing land use impacts in the city and then identify which land uses needs to be in the city to continue the economic growth and which land uses can be moved out of the city without affecting the economic expansion. After observing the land use impacts of Dhaka City, it can be determined that the ‘usable’ area of the city can be technically increased, if the BDR Headquarters and the Cantonment is moved outside Dhaka, and if the Tejgaon Old Airport is shut down. These three developments are making Dhaka appear more congested than it actually is because these are creating an uneven distribution of population density in the city. Population densities in these three land uses are very low compared to the density of the rest of the city. Bangladesh Rifles (BDR) and the army are definitely necessary to protect the sovereignty of the nation, but both the forces occupy vast land unecessarily within the city, where they do not have much function. Most importantly, by moving the BDR headquarters and the Cantonment out of the city, the economy will not suffer at all. In fact, if they are moved out then they can actually have more land than what they have currently. It will be a win-win situation for both the city and the BDR and the army. Currently, the Tejgaon Old Airport does not have much significance to the city as before, and leaving it open is simply a luxury for the city because this is also not having any positive impact in the economy of the city. Since, even the government thinks that the main airport, which is already in the outskirts of the city, should be moved even further out of the city, keeping the Tejgaon Old Airport open any longer just does not make sense. A major reason for traffic congestion in Dhaka is because of the lack of east-west connections in the city. By moving the Cantonment out of the city and shutting down the old airport new east-west links can be build in this area, which will definitely ease some of the congestions and solve some of the east-west connection issues. Currently, the two major developments that are thriving for space in this congested city are residential development and commercial development. Opening up these spaces will provide more space for public transport systems including green spaces for parks and playgrounds. Opening up these spaces for these types of developments will lessen the chaotic traffic situation in Dhaka appreciably and the city will not look as congested as before.This idea has been proposed by many experts of the country. The government should now start implementing the idea, as this is the only feasible way available to improve the living conditions of the residents of Dhaka city. Relocating Dhaka cantonment from Dhaka city is a far cry from reality. They are already building another cantonment in Mirpur to further aggravate the miseries of the public. Nobody knows the exact amount of billions of takas poured into such lavish projects and the amount plundered. In Tangail they built a cantonment and had natural gas line extended there while Tangail city had no such arrangement for the public. Cantonments are sprouting up almost everywhere in Bangladesh. It would be interesting to see how this white elephant devouring an undisclosed budget from peoples taxes defends our borders in future wars with India or Burma!